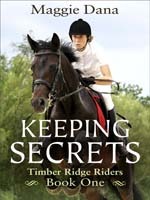 Keeping Secrets is an engaging read for the young horse enthusiast. Kate McGregor is a high school girl with a secret; one that has kept her from pursuing the passion of her life, riding horses. Running from her own life, Kate takes a job as an assistant to Holly Chapman, a feisty, wheelchair bound girl her own age. Holly suffers from “hysterical paralysis” due to a riding accident; she cannot feel her legs although doctors assure her there is no nerve or spine damage. Through her developing friendship with Holly, Kate rediscovers her passion for horses, and together, the girls uncover the truth behind Kate’s secret. The realistic setting and descriptions of horse care and showing in Keeping Secrets are welcome in a genre where authors often skimp on detail. The story is compelling, face paced and has the requisite set of characters that younger readers love to root for and against. The anti-hero of the story, Angela Dean, is a typical “rich girl, poor horseman” sort of character, but one who I can believe has the potential to develop further as a character in future books. [Spoiler removed. Happy reading. KTW] For the horse loving young reader, this book will deliver a terrific story, a good dose of “horse,” and a hope for a sequel. As a child, I read every horse book I could get my hands on. If you had a young horse fan in your life right now, which of your favorite childhood books would you pass along to them? Ellen and Kathy … thank you so much for this great review. I’m almost finished writing book #2 in the Timber Ridge series, called RACING INTO TROUBLE. It’s been an exciting ride and I’m now thinking up all sorts of new mayhem for my characters to get into for book #3.